Georgians will vote in local elections on Saturday, and this year there is quite an unusual candidate. 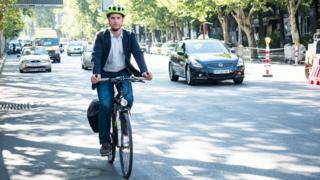 Originally from the UK, Joseph Alexander Smith has spent the last five years living in Georgia, and is now campaigning for changes in his adopted country - all from the back of his bicycle. It has been a rather unusual career change for the former librarian from London who is now an independent candidate in Georgia's forthcoming local and municipal elections. Joseph Alexander Smith, 32, is the first Briton to run for office in the Tbilisi City Assembly. He moved to Georgia after accidentally discovering "this weird country with its squiggly alphabet and its strange food such as bread stuffed with cheese". And like many first-time visitors, Mr Smith was quickly enchanted by Georgia. He is campaigning in his electoral district of Saburtalo on his bicycle, going door to door and personally introducing himself to his potential voters. The common reaction is a total astonishment by his command of Georgian, which he describes as "by far the most difficult language to learn". "Give me a hug!" says 82-year-old Nana Qavlashvili, on discovering Mr Smith is British as he canvasses on her doorstep. "It's so important for me that you speak good Georgian, you impressed me very much!" she says. In the next flat, a resident complains that she can no longer open windows because all she gets is car exhaust fumes. Air pollution is one of the key problems in Tbilisi. The city is officially home to one-third of Georgia's population, but unofficially more than 40% of Georgia's 3.7 million people live and work here. "One of the principles that I campaign for is the right to air, not just the right to breath clean air but to look out of your window and not to be confronted by cold concrete wall of a newly constructed building," says Mr Smith. It was his background working as a journalist writing about historical interiors in Tbilisi that got him interested in local politics. "I got involved with activists fighting against various construction projects and became interested in how the City Assembly works, and why we get some of the terrible results such as knocking down buildings of historical value and privatising land in the city centre." Just days before the elections the opposition protested against the Tbilisi City Assembly's decision to sell a plot of land in the city centre to a company widely reported to be linked to the country's former prime minister, billionaire Bidzina Ivanishvili. Opposition activists claimed the deal - for the symbolic price of 1 Georgian lari (31 pence, 40 cents) - was corrupt but the government defended its decision and described the project for which the land was sold as "one of the most strategically important investments" in Tbilisi. In a city which is going through a massive construction boom, and where new apartment blocks spring up like mushrooms after the rain, Mr Smith's message is much welcomed. But political analyst Kornely Kakachia, from the Georgian Institute of Politics thinks this may not be enough to get him elected. "Even though Georgia is heading towards the European Union and the so-called Europeanisation process has just started, I don't think our society is yet ready to see this kind of candidate, this is a very new thing for them." Having a British-turned-Georgian citizen running for the City Assembly even led some to accuse Mr Smith of being a foreign spy. One comment on his Facebook page reads: "I think you are financed by the Russians from Britain and you are fighting in the name of the Armenians." But, says Mr Kakachia, there is a fatigue among the Georgian public which is fed up with old players in politics and is desperate to see new faces, which might give candidates like Mr Smith a slight chance. The main contest in the 21 October election will be for the top post of Tbilisi mayor. Thirteen candidates are standing, including the former professional footballer Kakha Kaladze, who is being backed by the governing party and Mr Ivanishvili. Mr Smith says his non-affiliation with any of the political parties is his strength, and, if elected, he is determined to make the voices of ordinary citizens heard. "People are interested to see a British person, a foreigner that speaks Georgian. They realise straight away that I am foreign, they look at my flyer and see that it's not a Georgian name," he says. "But I always try to move away from my identity and ethnicity, because that's what I am here for - not as a travelling circus but as a candidate in local elections that really wants to achieve changes in the city."